Wistia and Marketo go together like peanut butter and jelly -- like Sherlock and Watson! Want to get in on the fun? Here's our guide to getting the Wistia-Marketo integration working for you. Here’s everything you need to know to get set up with Marketo! Create Smart Campaigns based on video data, including scoring, triggered emial, alerts to sales, and Interesting Moments. Before you get started, keep in mind only the Account Owner can access account settings to set up the Ingetration. If you’re all set there, to get the Wistia-Marketo integration working, you’ll need to be on a plan with marketing automation integrations enabled. Check out our plans page for more info! After you finish creating your Custom Service, click on View Details on your new service. Copy the Client Id and Client Secret into the Marketo integration area in your Wistia settings. Next, go to Admin > Integration > Web Services > REST API in Marketo and copy/paste the URLs for Endpoint and Identity into Wistia as well. Have those four pieces on information filled in, clicked Connect, and see that the integration is connected? Well then congrats, you’re all set up in Wistia! The last thing to do is set up your website. To track how people watch your videos and use that data to drive automation in Marketo, you first need to have a video embedded on your website. Here’s how to do that. Then just make sure Marketo’s Munchkin tracking script is on the same page as your video, and that video viewing data will appear in Marketo automatically. If for one reason or another you’re not set up after following the steps above, contact us and we’ll help you out. Want to learn how to put your fancy new Wistia-Marketo integration to work? The sections that follow contain the information you seek. Note: If you’ve successfully completed the steps above, you can move on to Collect Leads with Marketo Forms. This section is only relevant if you have the legacy Marketo integration connected. The first Wistia-Marketo integration was built on Marketo’s SOAP API. 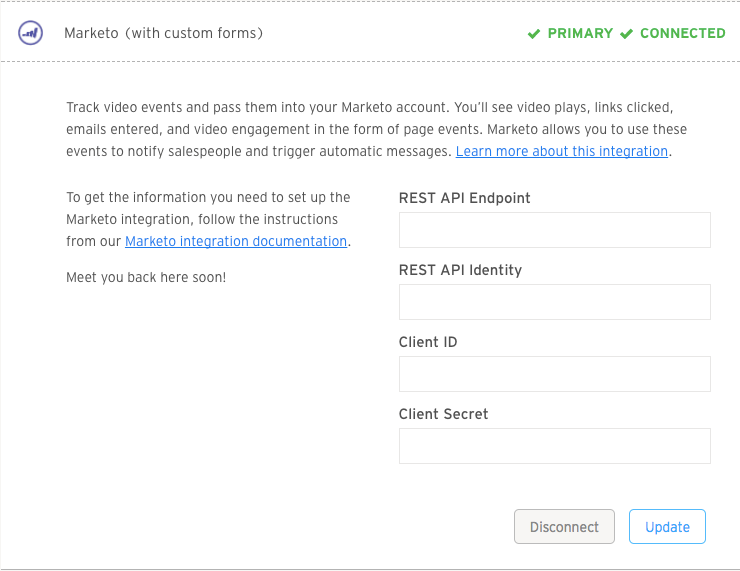 We’ve updated the Marketo integration so it’s instead built on Marketo’s REST API, which offers a lot more functionality. If you’re ready to upgrade the data flow between your Wistia account and your Marketo account, we’ve got the steps below to make that happen. To migrate over to Marketo v2 you’ll first need to disconnect your Marketo v1 integration. You can do this by visiting the integrations page of your Wistia account settings and selecting the Marketo (SOAP) integration: Account > Settings > Integrations. (Keep in mind, only the Account Owner can get into Account Settings.) You’ll see an option to Disconnect in the bottom right corner of that menu. Once you’ve disconnected your Marketo v1 integration, you can follow the normal steps for setting everything up to connect to the Marketo v2 integration. Make sure to select the version that asks for your Marketo REST API Endpoint (since that’s the Marketo v2 integration). Once finished, you’ll be able to use the more advanced parts of the integration listed below, like sending data to specific lists with Turnstile, and setting up Marketo Forms right within your video. 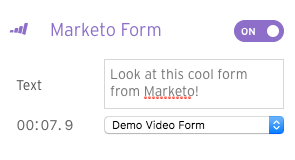 You can add forms created in your Marketo account to your Wistia videos. They’ll act exactly the same as Marketo forms, except that they’ll appear in your video like a Turnstile or CTA. Make sure that your Marketo Forms settings are adjusted so that fields like Lead Source aren’t updated on every form submission. Remember that time you configured Turnstile to connect to your Marketo account? Well now when people enter their names and email addresses (or just email addresses, if you’d prefer) into Turnstile, they’ll automatically get passed from Wistia to Marketo as new leads with the lead source set to “Wistia Video: (name of the video here).” You can also optionally add all the leads collected from a specific video in your Wistia account to a static list in your Marketo account. Don’t see the option to select a list? You must be on an older version of the Wistia-Marketo integration. From your Integration Settings page, disable your existing Marketo integration, set up the new one (it asks for your REST API Endpoint instead of SOAP), and you should be all set. You can read about migrating here. So that video was just an example, but if that was your video, you’d probably have a brand new lead right about now. That would be cool. “But Wistia,” you ask, “what if that person was already an identified lead in my Marketo account?” Glad you asked. In that case, only missing fields will be updated. For example, if you already had *bob@example.com as a lead in Marketo with a leadSource of Campaign X, but Bob filled out a Turnstile with his name, Bob Smith, only firstName and lastName would be updated. As a result, Bob would be a lead in Marketo with firstName Bob, lastName Smith, email bob@example.com, and leadSource Campaign X*. Fun fact: All of a person’s video viewing activity from before they entered their information into Turnstile will be associated with their lead record, so you can see exactly what the path to conversion was in the lead’s Activity Log in Marketo. Yet another fun fact: Their historical viewing data will live in Wistia too! Anytime you get a new lead through Turnstile, the person’s info will appear in right in your Wistia stats along all their viewing activity – even from before they used Turnstile. To get started with Turnstile, go to a video page in your Wistia account and open the Timeline Actions section of the Customize panel. Wouldn’t it be cool if when a person watches at least 50% of a certain video on your website, you could automatically send them an email about that product a few days later? Or if a person entered their email address into Turnstile, you could have a salesperson get notified to follow up? “Why yes, yes that would be quite cool indeed,” you say? Phew! Good thing we built this integration. Completing a Turnstile or Marketo form on a video is not a prerequisite in order for viewing data to appear within a lead’s Activity Log in Marketo. As long as Marketo recognizes the viewer as a known lead, their video views will be tracked alongside all other site activity. For anonymous viewers who later become known, all prior associated views will be visible in their Activity Log as well. Head to the Marketing Activities section in your Marketo account. Create a new Smart Campaign. Choose a folder, and give the campaign a name. A description too, if you’d like. 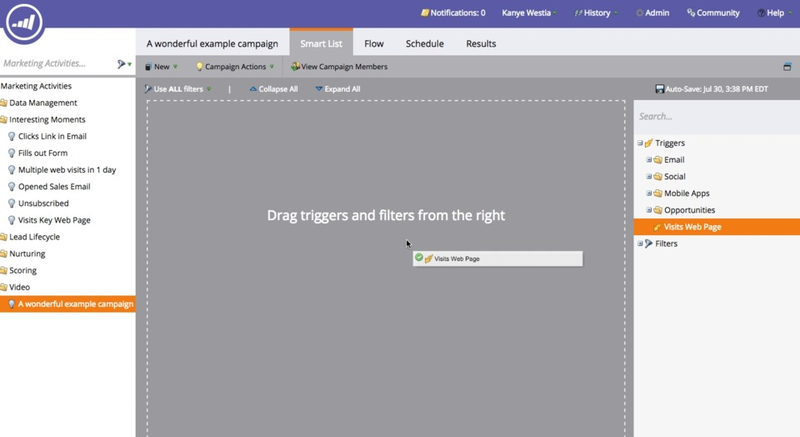 In the campaign screen, go to the Triggers section in the panel on the right. Now here’s where it gets a little weird, but hey, that’s what this tutorial is here for. All of events related to how people interact with your videos are recorded as “Visits Web Page” triggers in Marketo, even though they don’t have much to do with visiting a web page (beyond the fact that the video is embedded on one). The details of the type of event will be in the Trigger’s Detail description. So, find the Visits Web Page trigger, and drag that little guy into the “Drag triggers and filters from the right” area. Now it’s time to define the specific video event trigger. If you wanted to run automation when a person watches 75% of a video called Making French Toast at Wistia, you’d tell Marketo to set the trigger to Web Page — > is — > Wistia Video: “Making French Toast at Wistia” 75% Watched. 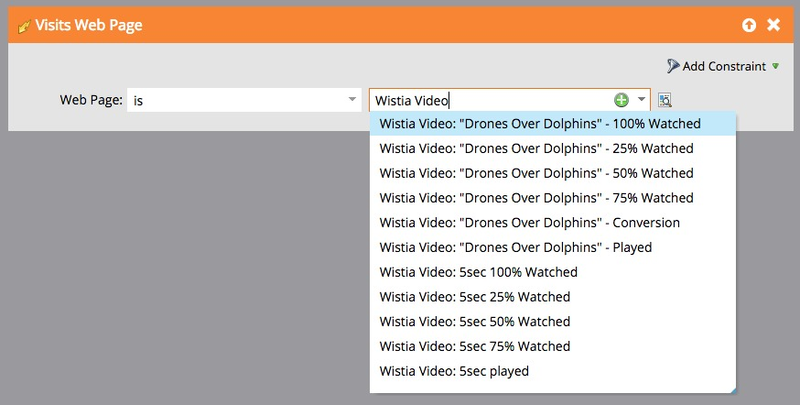 Alternatively, you can set broader triggers for when a viewing event occurs on any video across your website. For example, Visits Web Page — > contains — > 50% Watched or, contains — > Played. This is particularly helpful for scoring, as you won’t have to specify each video name. Once you’ve picked the right event for the right video, move onto the Flow step. That’s all Marketo’s domain, so check out the Marketo documentation for details. 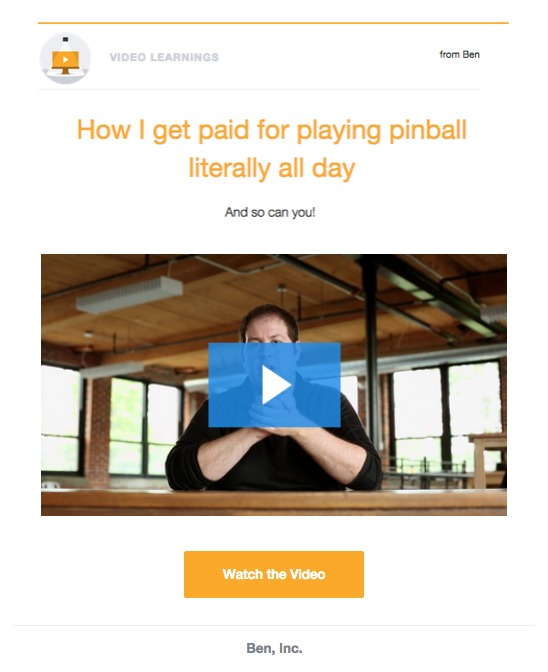 Email is a wonderful way to engage with your customers (and future-customers) … but email with video is an even better way. On the Link In Email Campaign tab, select Marketo as your email provider. Copy the Email Merge Tag from Wistia and paste it into your email in Marketo. Fun fact: When people receive your email and click through to watch the video, their email addresses will automatically pass through to your Wistia stats. Is the video embedded on a page where Munchkin is present? As mentioned above, the integration relies on Marketo’s Munchkin tracking script to sync viewing data to Activity Logs. Third party scripts cannot be added to a Wistia media page. As a result, videos must be embedded on your site for the integration to work. Is E-v1 present on the Page? If there isn’t an instance of E-v1 outside of the iframe, the Wistia and Marketo scripts will not be able to get the correct information from each other. The good news is that this is easy to fix by adding the E-v1 script to your page. We recommend adding it to the <head> element of your page. At this time, iframe playlists are not able to work with MAP integrations, including Marketo. Adding E-v1 outside of an iframe playlists will not solve this issue if you’re using an iframe playlist embed. You can read more about this on our playlist page. If you’re seeing a blank list instead of your forms in the Customize panel, this is likely because of insufficient permissions granted to your Marketo API User. To solve this, you’ll need to go into your Marketo account and navigate to the Admin page. You can modify the permissions in the Users & Roles section, specifically in the Roles tab. 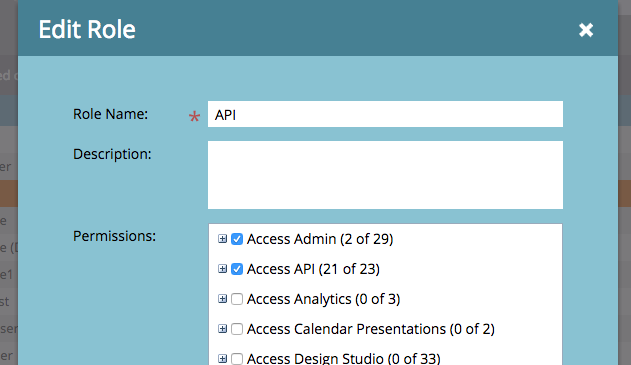 The Roles tab allows you to modify the permissions for the API user you’ve entered in your Wistia-Marketo integration. There are a lot of different permissions you can grant, but the key permissions to get your forms appearing are the Access Admin and Access API permissions. Make sure that those are checked, and save the user to update their permissions. If you’ve added custom styles to your forms, it’s possible that they will affect the styles within your Wistia media page or pages the video is embedded. This is because those styles are injected in a blank <style> element to the page. Sometimes, those styles may appear differently than expected when the form is embedded into your Wistia video. 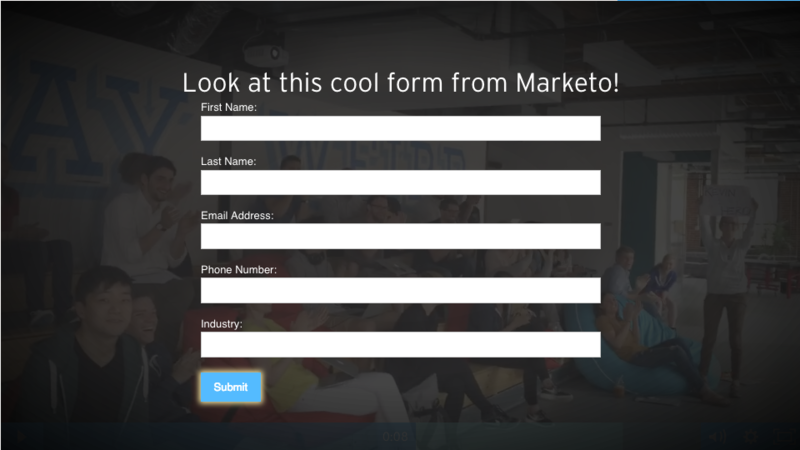 We recommend using the default Marketo themes for forms when possible. If you need to add styles to your forms, try minimizing the use of tools like !important attributes. This will help minimize potential CSS conflicts. Still not working? We’re happy to take a look! Give us a holler, and we’ll jump on the case.